You will construct a digital multimeter (DMM) capable of measuring voltage, resistance, and frequency. A keypad will be used to choose functions. An LCD will be used to indicate system state and measured levels. The sensitivity of the resistance measurement decreases as Vin increases, suggesting that you keep Rt<<R. 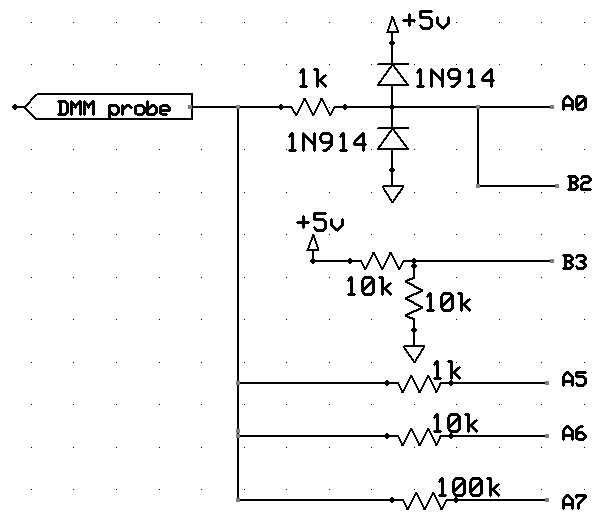 However, low Vin means significant quantization error in the ADC. You will need to keep Vin between about 0.1*Vref and 0.9*Vref during resistance measurements to keep 5% accuracy. The probe input goes to the ADC and internal comparator. This example (ADCtestGCC644.c uart.c, uart.h, project zip) shows how to set up the A/D converter to read a trimpot. This example shows how to get higher ADC accuracy by putting the MCU to sleep during the conversion to cut down digital noise. Note that some special timing code has to be added to make the UART work correctly when you put the MCU to sleep. 3e4 x 20e-9 = 60e-5 or 600 microseconds! This means that to get 8-bit accuracy after you change Vref, you must wait 1/256 = exp(-t/600) or t~3 mSec before doing another conversion! You will need to get user input from a keypad with one of two following configurations. Some keypads have the connector on the top, as shown. Some have them on the bottom. A demonstration keypad scanning code for testing your connections is here. An example of a debounce state machine for a single STK500 pushbutton (not the keypad) is included here for reference. (c) The i/o port pins will be used both as inputs and outputs. When they are inputs, they should have active pullup resistors. (d) On the 9-pin models, do not connect the common lead. Hints on debugging are here. -Wl,-u,vfprintf -lprintf_flt switches. An easier wayto print floats is to use the AVRLIBC stdlib function dtostrf as explained in AVRfreaks. An example. You may use the STK500 buttons if you wish instead of a keypad. One key on the keypad toggles between voltage, frequency, or resistance measurement. The mode will be indicated on the LCD. If autoranging is turned off, then successive presses of one key will select which range is used, and this range will be indicated on the LCD. Clearly, the indication will depend on what you are measuring. Voltage ranges of 5, 2.56, or 1.1 volts will autoselected for best accuracy in auto mode. You should be able to measure voltages from 0.2 volt to 5 volts within 2% (of full scale for a given Vref) accuracy. Resistance ranges of 1k, 10, or 100k will autoselected for best accuracy in auto mode. You should be able to measure resistances from 100 ohm to 100 Kohm with 5% (of full scale on each scale) accuracy. Frequency ranges of 10KHz or 1KHz will autoselected for best accuracy in auto mode. You should be able to measure frequency from 100 Hz to 10 KHz with 1% (at all frequencies) accuracy. Demo this program to a staff member. Show that all specifications are met by verifying values with a commercial DMM. Show that all keyboard and LCD functions work. At no time during the demo should you need to reset the system. The measured accuracies of your measurements compared to a commercial DMM. How you generated the various time intervals required by this project.